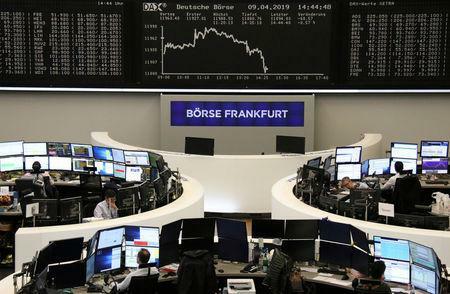 The euro fell in the aftermath of Draghi's comments on Wednesday, which underscored the risks facing the euro zone economy and supported the view of possibly more European Central Bank stimulus to prevent the region from slipping into recession. "The whole discussion on Brexit, which has lasted many years, really, is part and parcel of the overall uncertainty hanging over our continent", Draghi said. Speaking at a press conference in Frankfurt following a meeting on Wednesday, ECB chief Mario Draghi warned of the risks affecting growth in the eurozone, describing current economic indicators as "weak". However, AMP's Oliver said some encouraging economic signs were now emerging, helped by the "great retreat" on policy by global central banks, fiscal stimulus in China and progress in Sino-US trade talks. As well as Brexit and the possible disruption of flows of goods, slowing trade is one reason for the cut, with business confidence having been hurt by uncertainty over whether the U.S. and China will settle their trade disputes or add more tariffs on goods. "The information that has become available since the last governing council meeting in early March confirms slower growth momentum extending into the current year", the European Central Bank president said in a statement. The ECB President's remarks came hours before European Union leaders' met with British Prime Minister Theresa May to agree on a new Brexit date, initially set for 12 April, and the conditions attached to it. Draghi said the consequences of Brexit would be different depending on "whether it is a hard disorderly Brexit or whether it is properly managed with an adequate transition period". Still, he was "hopeful" that major disruptions could be averted. Draghi spoke after the central bank, which sets monetary policy for the 19 countries that use the euro, left interest rates and its policy promises unchanged. Some analysts think the bank may eventually push back the earliest date for an interest rate increase from the end of the year into next year. "We haven't discussed the pros and cons of mitigating measures ... we need further information that will come to us between now and June", he said, explaining that there had been a consensus on the need for further analysis. "The euro area expansion will continue to be supported by favourable financing conditions, further employment gains and rising wages, and the ongoing - albeit somewhat slower - expansion in global activity".